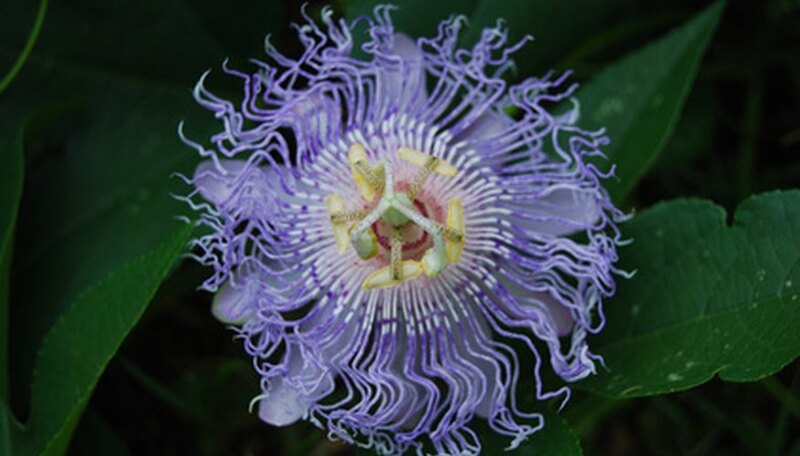 The Passiflora or passion vine is grown for its beautiful and unusual flowers of red, yellow, lavender or purple. 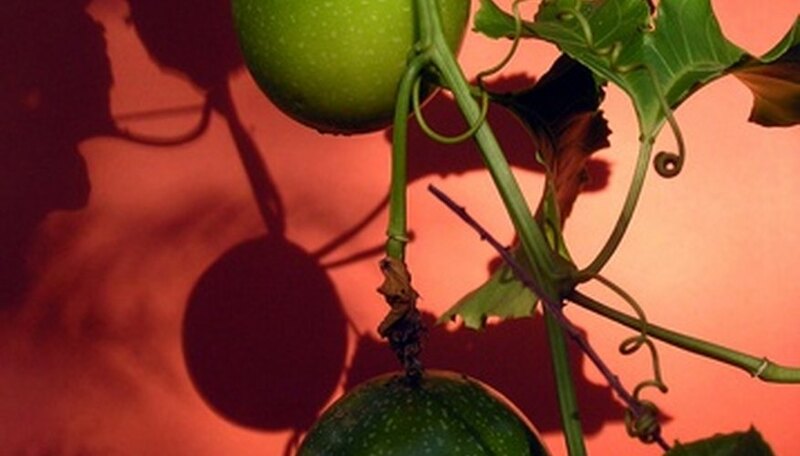 Some varieties of Passiflora produce an edible egg-shaped fruit that is eaten fresh or made into jams or jellies. They grow best in USDA zones 6 to 10. In frost-free areas they grow all year, but when exposed to freezing temperatures, they freeze to the ground and regrow from the roots in the spring. The Passiflora vine grows to 30 feet or more in one season and covers large trellises quickly. They are an important source of food for butterfly larvae. Locate a place in the garden with well-drained soil. Passiflora cannot live in water-logged or soggy soil. The location should be near a trellis or fence so the vine can climb upward throughout the season. A trellis 5 feet tall and 6 feet wide is sufficient, although they tend to cover larger trellises if they are provided. Passiflora vines can be trimmed back as needed during the growing season. Clear the area of all weeds and garden debris so the Passiflora vine has no competition from other plants. Loosen the soil around the planting area with a shovel to a depth of 6 inches. Spread a 2-inch layer of compost over the planting area. Work the compost into the top 2 inches of soil. Rake the area smooth. Plant the Passiflora vine after the danger of frost has passed in your USDA zone. Dig a hole the size of the root base of the Passiflora plant. Plant the Passiflora plant at the same depth it was planted in the container. Add water to the planting hole as you add the soil around the Passiflora root base. This is done to avoid the formation of air pockets around the roots. Lightly tamp down the soil around the root base of the plant. Cover the area over the root base of the Passiflora vine with a 1-inch layer of mulch to conserve moisture and control weeds. Add water around the root base of the Passiflora vine to keep the soil moist, but not wet, during the growing season. There is no need to water the Passiflora vine while it is dormant during the winter. Butterfly larvae may eat the vine to the ground in spring. This is normal and the vine will quickly recover by early summer.